Pioneers in radio technology and audience interaction, 1977 - 1983. Thameside Radio was founded in 1977 by Bob Edwards and Tony Lloyd. While still at school the two brothers had set up medium wave station Radio Anonymous and then both worked for the original London Music Radio from South-East London. When that closed in 1977 they began preparations for a new station, eventually settling on the name Thameside Radio. Thameside would broadcast on VHF using an innovative new transistorised transmitter designed by Tony Lloyd – and when they launched the only VHF pirate on the air every single week. In 1977 Radio One would close down on Sundays at 7pm after the chart show, which was simulcast on Radio Two's VHF transmitters. By starting at 7pm on 90.2, the first spot up from Radio Two, Thameside hoped to be the first to catch listeners tuning around hoping for music when the top forty ended. The first broadcast went out on 11 December 1977, initially operating for just one hour and presented by Bob Edwards. Hours were later increased, with shows first by Tony Lloyd and then Dave Birdman, whose jingles had been featured on the station for some time. His best shows were fantastic radio, melding Dave's own sketches and jingles with comedy records and carefully-chosen music. Where Thameside was different was in the level of audience participation, fostering a real sense of community among their listeners. Soon the audience were directing the programmes, with regular competitions, lots of requests and even phone calls to listeners. Sometimes they would go round to their listeners' houses to deliver prizes or even to record whole shows using a mobile setup. 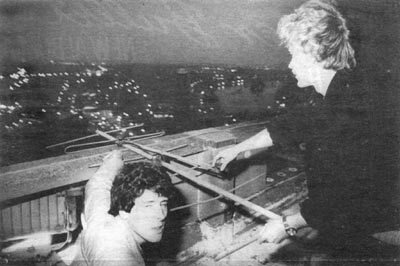 In 1979 the station went one step further in its audience interaction, hosting a party in Hyde Park from which they broadcast live – the first time that had ever been done by an unlicensed station. Aleks Wright and Sarah joined to present a music news roundup, with Aleks also initiating the popular Thameside Fast Food Survey, where they would invite listeners to meet up at a different restaurant each week. There were also parties on the Circle Line and a magical mystery coach trip to Brighton. By the end of 1982, weekly broadcasting was taking its toll on the station's regulars. Thameside had also been hit hard in listener numbers when Radio One finally began Sunday evening broadcasting, remaining on Radio Two's VHF transmitter network after the top forty with a request show presented by Annie Nightingale that aped Thameside's. After a raid on 15 May 1983 the station never returned to the air. Read more about Thameside Radio in the new book London's Pirate Pioneers.